Artistic representation of Tele Vue Radian line courtesy of Tele Vue Optics, Inc.
"Optimizing this new design with fully multicoated exotic glasses, we reached our new goal of full field sharpness with true orthoscopic linearity, highest contrast for critical planetary viewing and compact size. The size and weight blend also makes the Radian preferable for small instruments and bino-viewers and allows the convenience of being parfocal with other 1¼" Tele Vue eyepieces." Like all Tele Vue oculars, Radians are a proprietary design that is assembled and finished to the highest standards in factories in either Japan or Taiwan that do not make competitive products. 100% quality control is assured; all Tele Vue oculars, whether they are made in Japan or Taiwan, are shipped to Tele Vue's Chester, New York facility for testing. Those sold in Asia are then shipped back to the Far East after quality control inspection in New York. Radians incorporate six elements in four groups or seven elements in five groups, depending on focal length. The optical design incorporates expensive, rare earth glasses to optimize performance and minimize aberrations. All air to glass surfaces are fully multi-coated, lens edges are blackened and they have anti-reflection threads for maximum contrast. Ocular upper bodies are made of aluminum for strength and lightweight, while mounting barrels are heavily chrome plated to resist scratching and incorporate a wide safety notch undercut to prevent loss if the scope's retaining setscrew should loosen. They are threaded to accept 1.25" filters. Radians are finished in a glossy anodized black with a wide, checkered, rubber non-slip band. The bright green Tele Vue name and focal length markings are engraved around the body of the ocular, not screen-printed. They are very attractive and well-finished oculars that practically radiate quality. Radian 14mm Eyepiece. Photo courtesy of Tele Vue Optics, Inc.
Radians come with a soft rubber eye guard to protect eyeglasses from scratches. Protective caps for both front and back to protect the ocular when it is not in use are provided. One of the nicest Radian features is their "Instadjust" click-stopped, push-pull, sliding eyeshade. This helps observers comfortably and conveniently achieve proper eye position, while excluding ambient light. I can attest to the fact that it works and it is the nicest ocular eyeshade system I have used. The Pupil Guide is another, rather odd, Radian feature. This is a thin plastic disc with a large hole in the center that is placed directly under the Radian ocular's soft rubber eye guard. Its purpose is to help novice, non-eyeglass wearing viewers "zero-in and stay centered on the exit pupil." I have not found it necessary to use the Pupil Guide, but one is included with every Radian eyepiece. Remember, all Radians have the same AFOV and 20mm eye relief. From the user's point of view, unlike most ocular designs, it is just as easy to look through a 3mm Radian as an 18mm Radian. Unlike conventional Plossl or Ortho oculars, you can simply buy whatever focal lengths the light grasp of your telescope and the anticipated seeing conditions will support, without concern about tiny exit pupils or eyelash-length eye relief. I find Radians to be very easy oculars to look through and the 60-degree AFOV is just about perfect. It is wide, yet I can see the entire field of view without having to move my head, something I cannot say about the extra wide 82-degree AFOV of Nagler oculars. Tele Vue oculars are warranted to the original owner for five years and can be cleaned, serviced or repaired by Tele Vue. They traditionally have a high resale value, should you ever need to sell them. If you are getting the impression that I am impressed by Tele Vue's Radian line, you are correct. 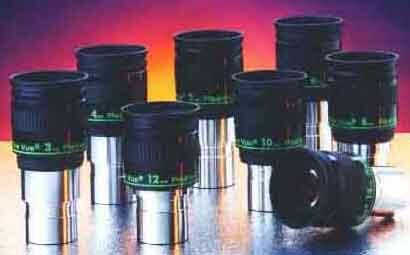 They have become my favorite short and medium-short telescope eyepieces and I recommend them without reservation. Copyright 2009 by Chuck Hawks. All rights reserved.